Flying drones and robots now patrol distribution warehouses – they’ve become workhorses of the e-commerce era online that retailers can’t do without. It is driving down costs but it is also putting people out of work: what price progress? It could be a scene from Blade Runner 2049; the flying drone hovers in the warehouse aisle, its spinning rotors filling the cavernous space with a buzzing whine. 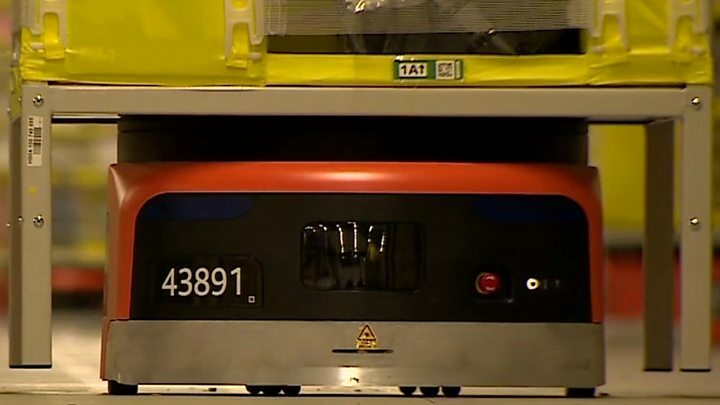 It edges close to the packages stacked on the shelf and scans them using onboard optical sensors, before whizzing off to its next assignment. But this is no sci-fi film, it’s a warehouse in the US – one of around 250,000 throughout the country, many gargantuan in size: retail giant Walmart’s smallest warehouse, for example, is larger than 17 football fields put together. And these automated drones are now doing the jobs humans – on foot, or operating fork-lift trucks and mechanical lifts – used to do: and they’re doing them more cheaply and more accurately. “Every year companies lose billions of dollars due to misplaced items and faulty inventory records in their warehouses,” says Fadel Adib, an assistant professor of media, arts and sciences at Massachusetts Institute of Technology. Two drones can do the work of 100 humans over the same time period, according to supply chain specialist, Argon Consulting. This means they can do several tours of a warehouse – even at night – compare results, identify discrepancies, and build up a much more accurate picture much more quickly. Drone makers claim scanning accuracy of close to 100%. Matt Yearling, chief executive of Pinc, one of the firms offering such aerial robots, says they can save warehousing and logistics companies millions of dollars. “Nobody has 100% accuracy – including Walmart and Amazon,” he says. “For a warehouse that is 95% accurate, it means that 5% is ambiguous. So if the warehouse is storing $100m [£75m] worth of inventory, then $5m is uncertain. Pinc’s drones use hydrogen fuel cells, enabling them to fly for up to two hours – four times as long as some battery-powered drones. French firm Hardis Group has also launched an inventory-scanning drone – EyeSee – and emphasises how autonomous it is. “Flight orders and flight plan execution are ensured by our Android application,” says Stephane Cadenet, manager of the firm’s drone programme. 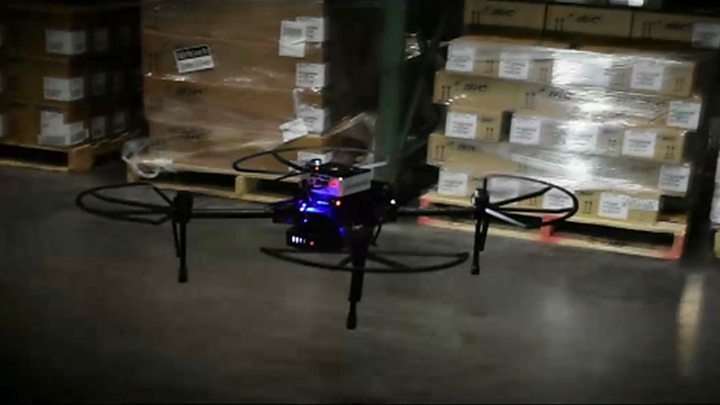 Other companies, such as Infinium Robotics, have also developed drone scanning systems. Of course, retailers have been using robots and automated systems in warehouses for some years. In 2012, fashion brand Net-A-Porter said its robot pickers were already 500% faster than humans, while online retailer Amazon’s Kiva robots have almost become famous. “Innovators are working to make drones and robots an integral part of warehousing, inventory, and logistics,” says JP Gownder, a principal analyst at research firm Forrester. But all this cost saving and efficiency comes at the expense of jobs for humans. The $2.3tn e-commerce industry is huge and growing, but almost 75% of e-commerce companies employ no more than four people. So it is no coincidence that in the US some 89,000 shop workers were laid off between October and April this year, while employment in New York City clothing stores has declined for three consecutive years. Forrester estimates that automation technologies, including artificial intelligence, will replace 17% of US jobs by 2027. And growth in new types of employment will not be enough to compensate. “Automation does create opportunities for new jobs – equivalent to 10% of today’s jobs,” says Mr Gownder. Ryan Bax, industry analyst for mobility at research consultancy Frost & Sullivan, concedes that the use of drones and robotics in warehousing will lead to job losses, but believes growth elsewhere will compensate for this. “As automation reduces the demand for lesser qualified jobs, the need for specialised skills within the logistics sector will grow,” he maintains. And he thinks automation tech may even become mandatory once it has been shown to reduce accidents in the workplace. This will be small comfort for the thousands of warehouse workers displaced by drones and robots, but it is the inevitable consequence of our desire for online convenience, cheaper prices and faster deliveries.